Good evening, my Puddlers. What a week this has been for me. Some major aspects of my life are changing even at this second and I may be able to reveal details to you at some point in the near future. I feel as though I am living in an episode of Mad Men, perhaps even a season. So, take that, at this moment, for what you will. On this evening, in the aftermath of snow, I am giving you a column by the winner of the 2010 Puddles of Myself Henry Jones Sr. Quest for the Holy Grail Award, the one, the only, Mark Jack. Now, I know I usually pump up the guest columnists on the blog, but this week Mark Jack is bringing to light a great point - not many people still read Ralph Waldo Emerson. I wrote about and read a lot of work by Ralph Waldo Emerson in college and he remains one of the best writers on the notion of the soul, of passion, and of remaining spiritually liberated in the history of the English language. It seems very fitting to read him on a quiet day, when large clouds and snow muffle New York City. I highly recommend you look into Emerson and his work immediately. Ah, em, mmmm, you’ll have to excuse me. I have been feeling a little under the weather lately. I have been feeling small and under the weather. Sometimes I feel like a small boy under all this weather. So be kind. The calendar became quite monotonous on the first of this month, and as we may have been told to reminisce just days before, now we are commanded to look ahead. And yet the shape of things to come is not so easily determined, or, is not so easily Euclidean. The creation of triangles progressed throughout the last year, but we are, here, in the first weeks of this new year, hopelessly contorted and contained by so many once triangulating lines. I am worried by such entanglements and horrified by our calm. We most avoid the plague of wistful tones. I spent a few days at my parent’s house since last I wrote to you all, which was pleasant, though the compulsion to spend some quality time with my folks and all my old friends was, and is always, a little overbearing. Sometimes I feel like a small boy under all this friendship. What did we have to say to each other? Nothing, really. I sat with my oldest friend, Ryan, at a bar and in the middle of our visit, for almost a minute, we were silent. We just sipped our beers and sat—together. That felt the most right. With my father I conversed, as usual, on themes just vaguely spiritual, which is to say, protestant and liberal. He is a minister. We began, my father and I, to explore the influence on our thought. We began, that is, to speak again of Emerson. I do not know what has become of the man and his influence, but I feel/fear that he/it has become somewhat less than en vogue. Where do we establish lasting influence in the short history of American literature? Surely every time I mention Melville I cause many a head to shake affirmatively. I would, and do, nod just the same. Poe is given less than he should, maybe, but his place is sure and still explored with some enthusiasm. I could go on, but I’ll refrain, and suggest instead that Emerson is too infrequently read — this is a shame. There is something about his writing, which, unlike Thoreau, speaks to calm thoughtfulness. It is the writing of middle age, and perhaps too often only desperate youth, or maybe hoary wisdom, excites our reading eyes alone. We do not need, it seems, to read the advice of the calm Emerson, but his sentences are not so terribly calm, nor are they calmly terrible. There is something in Emerson, which is something I’ve come to observe in most people, and that is that strange mix of knowledge hesitantly understood, of experience and memory only unevenly incorporated. In our youth we have our lives before us and great stores of surety. Even in our inexperience we remain convinced of our ability or future ability to know all things. We can only ever, no matter what our age, look with some vague assurance upon the coming wisdom of old age. So much of our lives, and almost all our lives are lived between and in the midst of knowledge and lack, or perceived knowledge and perceived lack. 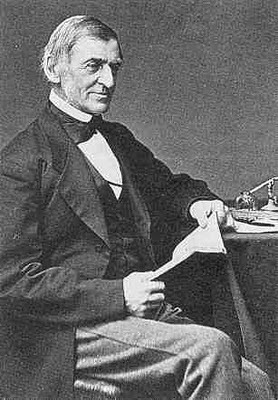 Emerson is the great conveyor of the mind at such an impasse and is a great comforter of the same. We should read him more. I, for my part, spend my time convincing my self of my own activity. I don’t think about it. Mostly, there is too little room for all the considerations I must endure, but I do not see any reasonable way to go about editing.